Pirate Slots is a highly lucrative slot machine by GameOS software developers. This classic slot is created with 1 payline and 3 reels. The payline is placed at the middle of the reels. The game takes the player on a journey in the sea to find some hidden treasures. It is made with cheerful music and fantastic design which makes it extremely enjoyable. The three reels are set on a tropical beach with a blue ocean. The visuals and graphics used, give the slot a beautiful and relaxed look. The developer has put so much attention to details which assist players to keep on playing without getting bored. The icons on the reels are a treasure chest, a ship, a gold stash, a treasure map, a canon, a compass, a parrot, and a flag. The simple set up makes it easy for any player to understand the rules of the game. The player here accompanies the huge pirate ships on the calm beaches and stormy waters surrounded by palm trees in search of treasure chests. The one payline makes it easy for the player to land winning combinations. When playing Pirate slot for real money, go to the command section to set your bet. A player can play with either one or two coins. Set the value of the coins you desire to bet on and press the Spin button. The coin value ranges from $0.001 to $5. Press the Max Bet feature to place the maximum bet. 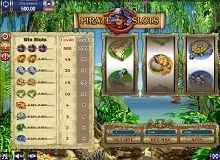 Free Pirate game has been split into three parts which are the reels, the paytable, and commands found under the reels. The paytable is located on the left side of the reels. It shows the total balance, and thus the player is able to keep track of their wins during the gameplay. There is a ‘full screen’ button on the bottom right side where one can change the game to a full-screen mode. Consider playing with the full-screen mode since it enhances a person’s playing experience. The autoplay button allows you to continue playing even without pressing the spin button. Pirate slot machine only features 9 symbols. The player wins when they get a minimum of one winning combo on the payline. All the wins have to begin from the left to right side. The payouts will differ depending on the symbols on the winning combo and the placed bet. The symbol combination in this slot is a little different. For example, one can form a winning combo with a pirate flag, parrot, compass or cannons followed by any other two icons on a payline. For the other four symbols, the player will need two of a kind on the payline to create a paying combo. Combinations with a captain tend to be more valuable. To earn the jackpot prize of 2000 coins, one needs to land three captain icons in a row. The interface of the Pirate game is quite convenient for players. The player is free to switch off the sounds and music from the control panel. The gameplay is simple. There are no free spins, wilds, scatters or bonus rounds. Despite all these, players love the three spinning reels set on a beautiful backdrop. New players are not intimidated by the design and veterans find it fun to play a basic game. 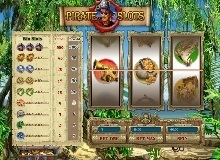 Pirate casino slot online gives players a platform to control the gameplay so that their spin matches their playing style. It may not have bonus features, but the solid gameplay and high-quality graphics make it enjoyable. It is a low volatile game which awards players small wins multiple times. The return to player (RTP) is 95.54%. 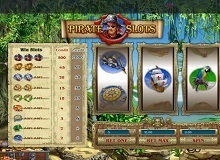 Play Pirate slot machine online if you are looking for an enjoyable game with a simple style. The slot is ideal for both new and experienced players. One strategy to win the game’s jackpot is to play on a maximum bet. The betting range is favourable for both low and high rollers, and thus there is no excuse of failing to enjoy this fantastic game. 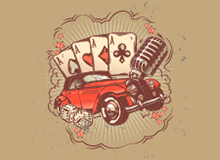 The free version is available on online casinos ideal for players who don’t want to gamble with real money.